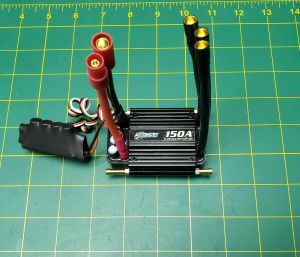 OSE Raider 6s 150 Amp Esc. Designed with large heat sink and dual water cooling tubes for superior cooling. Heavy 10 gauge wire and 4 capacitors. 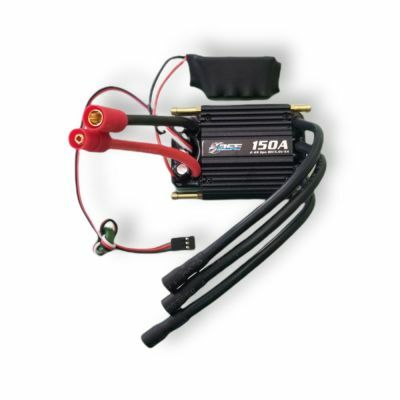 - Extra capacitor bank for improved performance. - Preinstalled 6mm connectors on the motor and battery ends. - And most importantly, After sales service within the USA. Instead of having to return things to China. We made this super easy to install. We install 6mm female bullet connectors on the motor side. 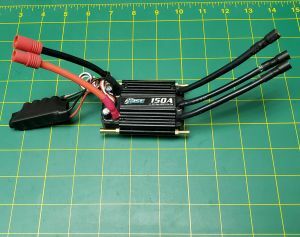 This allows a plug and play esc when combined with the Leopard Motors we sell (contact us if in doubt about your setup). We then install a OSE-qs6p high amp connector for the Battery End. 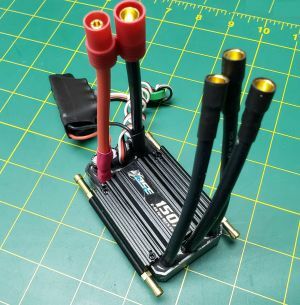 This esc is specially designed for use in rc boats. Excellent waterproof design allows this ESC to work in wet conditions. Optional LED Program Box for easy setting of all the esc's parameters. Thermal protection, if esc goes over 100C (212F) the output will reduce to and not return to normal until the temperature reaches 80c (176F) or less. Built in BEC (battery eliminator circuit) to power your receiver. Peak Current: 900 Amps. This is only for a brief second or so. Click here for full esc manual. Click here for program box manual. (3) Installed ose-6bullet connectors soldered onto the esc motor end. (1) Installed ose-qs6p connector soldered onto the esc battery end. (3) Loose OSE ose-6bullet male bullet connectors. Note: This esc was designed to work in an environment where its possible for the esc to get wet on occasion. Not for use undewater. OSE does not suggest using this item under water!! This esc is suggested for smaller boats upto the 27"- 40" (550mm - 1000mm) range. Because there are so many variables with each hull and installation its impossible to specify all the applications for this esc. 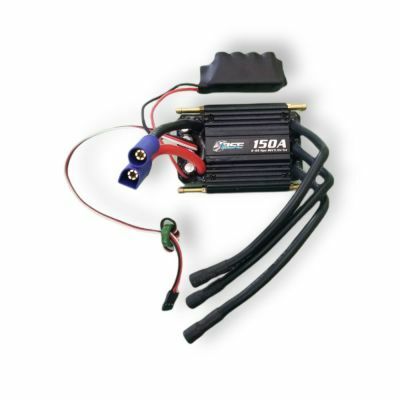 If you have any questions on using this esc with your particular boat, please contact us before purchase. great esc and service from Offshore Electrics! This is a very good unit . Obviously closely related to a Seaking it has all the benefits of that relationship without the cost. Good cooling and strong current handling, while its also quite low in profile and easy to place in the hull.